Farrah is 5-years-old and LOVES Rainbow Dash Equestria Girl. So I thought... “how hard could it be to hand make?” The answer was... pretty hard lol!  And quite time consuming. It all started with the blue crochet tube top. 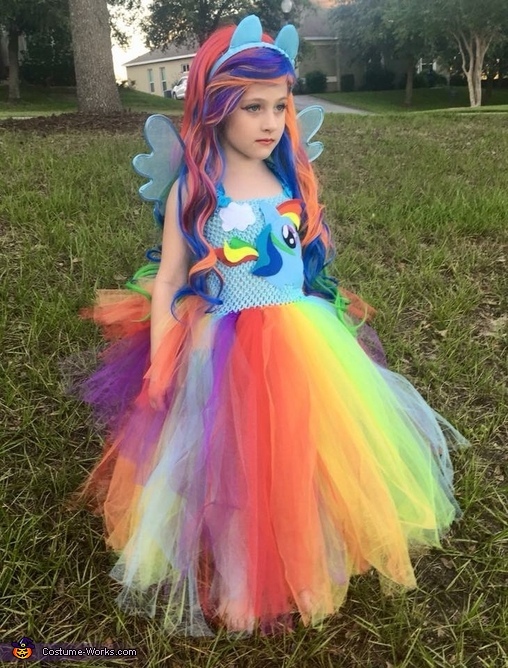 Every piece of tulle in all the colors of the rainbow were cut to length and then knotted into the crochet one piece at a time. The bottom layers were solid color tulle and the top layers sparkle tulle. That was the time consuming part. A tail was made onto the back of the dress by shortening the layers gradually as I went up the back of the crocheted top. Ribbons were then used to make straps to hold up the weight of the dress. Then I used different colors of felt to make Rainbow Dash on the front of the crocheted top and used glue and stitches to hold it all in place. I was able to find a high quality, bargain wig with rainbow colors from China for $11. It just took about 3 weeks to get to us, so preplanning was a must. I found the wings and pony ears on Amazon. All together the entire costume costs about $65 and took around 12 hours to complete. My daughter was in love with it and it made all the work well worth it!! !